I’ve chased the fox all the way to the end of the Fox Chase Line, and now it’s time to review its last stop! Okay, well, that was a terrible intro. 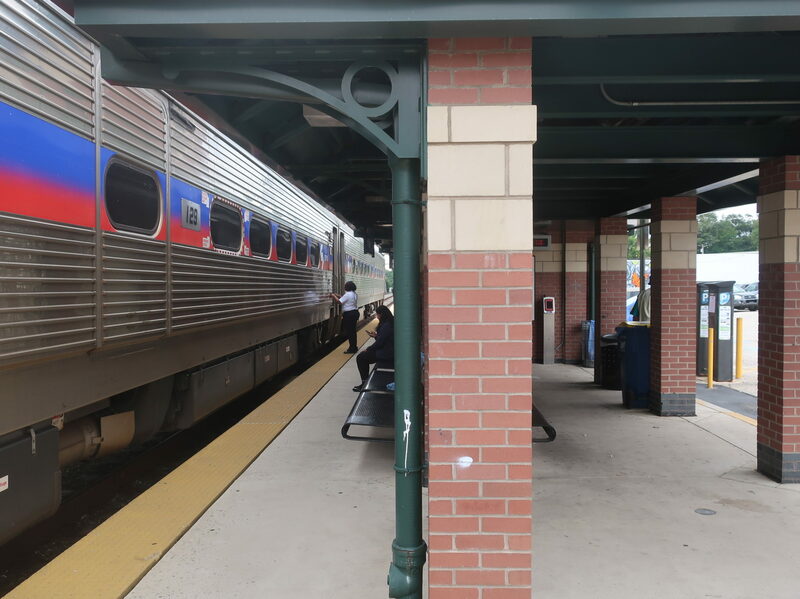 Ahem…Fox Chase Station. 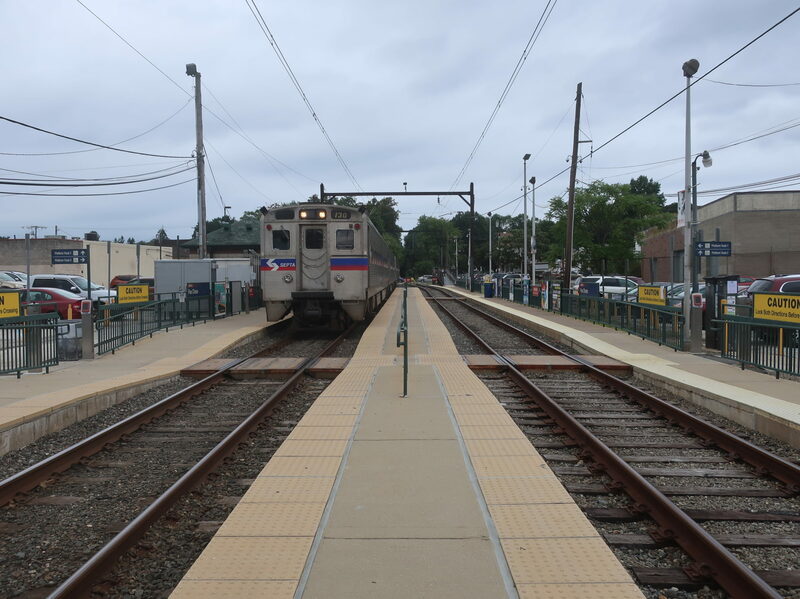 Fox Chase has three platforms split between two tracks. Since this is a terminal station, I imagine that trains can board on either track here, but the one to the west is far superior – we’ll see why in a bit. Out here, the platforms are all narrow, and they’re mostly just meant to provide extra capacity for longer trains. 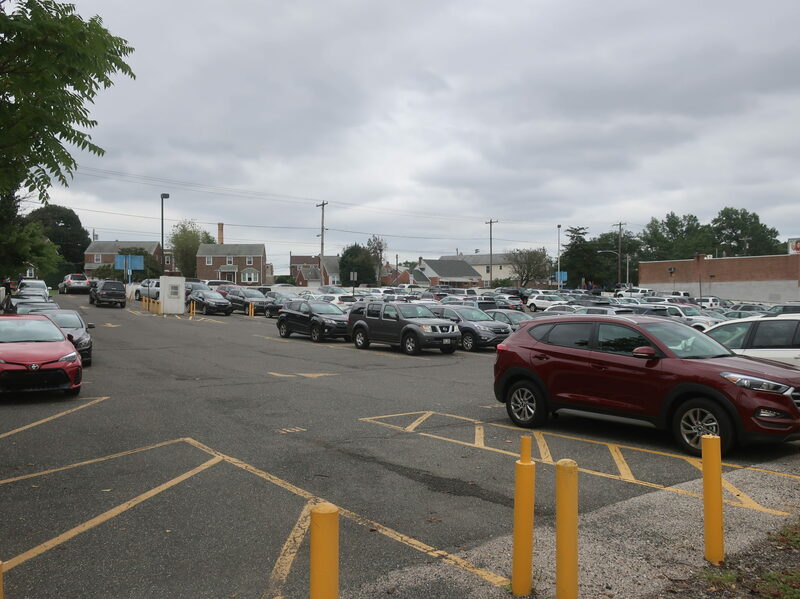 One of the parking lots. There’s a pedestrian crossing across the whole station that leads to the two parking lots, one on each side. The 314 spaces in total aren’t managed by SEPTA, but rather by the Philly Parking Authority itself. They have Pay-by-Phone set up, which is great, but if you’re gonna go analogue, you have to pay at these decrepit old machines. The rates are decent, though: 2 bucks per day, up to a total of $14. You could park your car here, take the train to the airport, and go on a week-long trip if you wanted to! At least this platform gets wide eventually. Yes, Platform 1 (the western one) does get wider, but it takes its sweet time doing it. The wide part is actually pretty nice, though – it has the only shelter in the entire station, the only benches in the entire station, the only departure board in the entire station, and the only building…in the entire station. Okay, I’m not so mad about the last one. But seriously, doesn’t this say something about how few amenities this place has? The best photo I could get of the inside of the building. 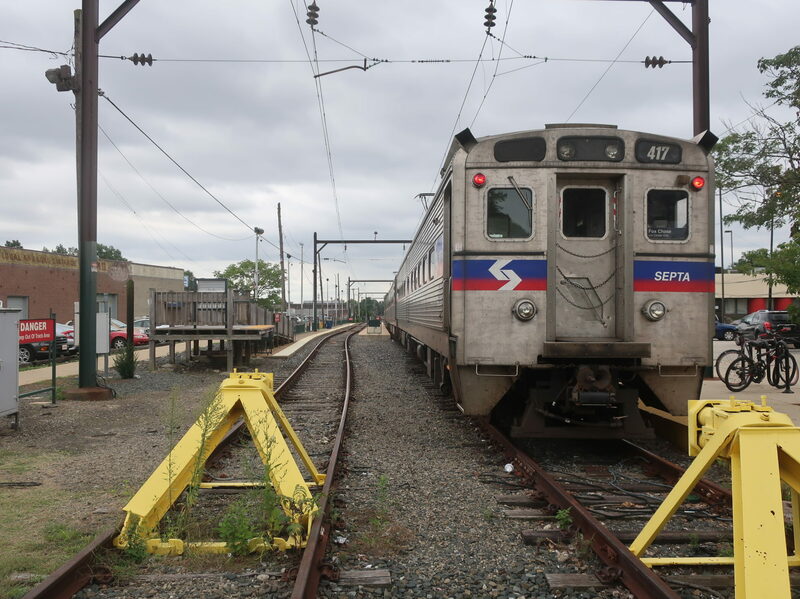 Like most SEPTA buildings, this one is only open during the morning rush period. For what it’s worth, though, it looks quite cozy inside. 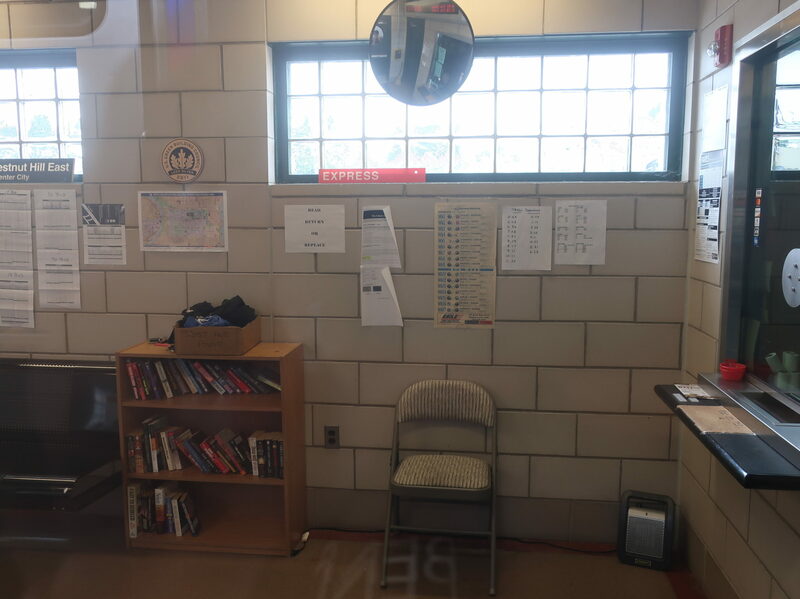 It has a ticket office, lots of seating space, outlets, a small library, and various posters and trinkets on the walls (including destination boards for Silverliner IV trains, a sports schedule, and a LEED placard – Silver, apparently!). Welp…too bad it’s only open in the morning rush. The entrance of the station on Rhawn Street. Further north, both tracks get mini-high platforms, which for once are located in a convenient place that’s closer to the station’s entrance! Well…unless you drove here. Oh well, it’s a start. Anyway, other amenities here include newspaper boxes, bike racks, and a few wastebaskets. The eastbound stop for the infrequent 28 bus is really well-placed right at the station, but if you want to go west, you have to jaywalk and hope for the best, since there’s no crosswalk here. They were digging up the tracks on the other side of the street when I was here, completing the trailification of the former Newtown Branch. 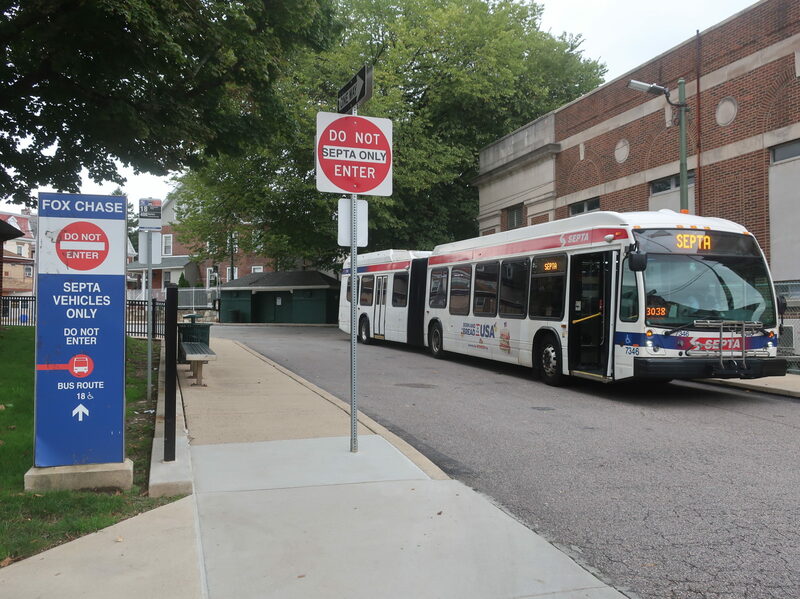 Just a block down Rhawn Street is the starting point for the 18, the busiest bus route on SEPTA. It gets its own little loop, which offers…well, not much, really. A bench and a wastebasket, and that’s about it – most of the amenities are for the drivers. At least the loop wraps around a nice park, though. Also, there’s the 24 bus, which just kinda…stops on the street. Yeah. Waiting for the trip back to Center City. Pros: Well, geez, look at that ridership! Also, most of those people must walk or take the bus here, since that’s a ton more people than what the parking lots can hold. 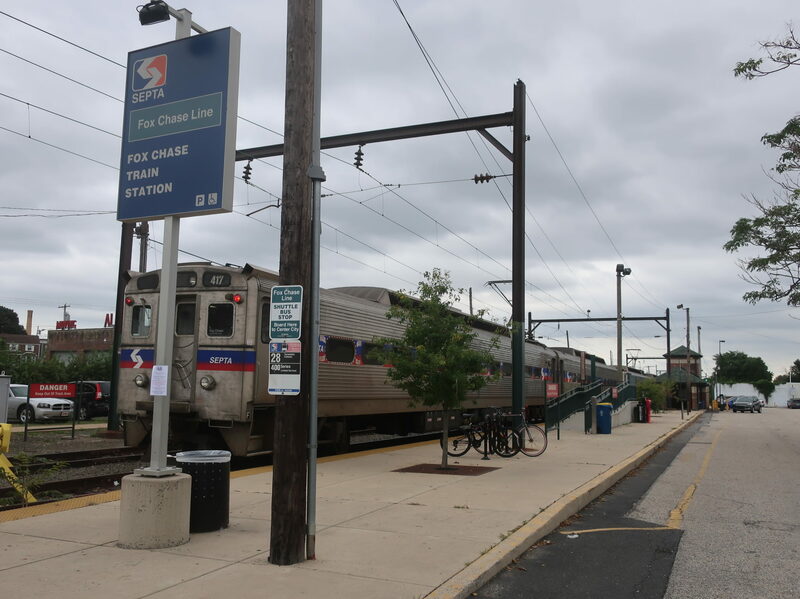 After all, there are many dense, walkable residential neighborhoods around here, and as much as people want to see service restored to Newtown, the new trail will probably bring even more riders to Fox Chase. As for the station itself? Well, the building is decent and everything is wheelchair accessible. That’s good. Cons: Basically everything else about the station. Heck, the building is only open during the morning rush, so you’re stuck waiting underneath it otherwise. I realize this is standard procedure for most Regional Rail stations, but for the 9th-busiest stop on the system, I would expect at least a little bit more! Also, while the bus loop is functional, it really needs shelter. Even something basic would suffice. Nearby and Noteworthy: There’s a cute little village next to the station. It’s not the kind of place you can really come to and walk around for hours in, but it has a few interesting places: a weird furniture store, a classic German meat shop, and a few Italian restaurants with varying degrees of fanciness. I gotta be honest, most of the ridership for Fox Chase probably comes during the morning rush. And during the morning rush, it really is a nice place to wait, since that great building is open. So…I don’t want to take away too many points. But if you’re here at any other time, it’s a pretty lame station. Also, if you’re here for the bus, then it’s even lamer! So overall, most of the time, you’re getting a lame experience out of this station. Six-outta-ten, BAM!